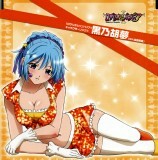 This CD contains character image songs to the TV anime Rosario to Vampire. Songs by Fukuen Misato (福圓美里). "Toki ni Ai ha" is a cover of Matsumoto Iyo's song from 1983.